FA: Bill Ohran, Dan Snyder, and Robbie Colbert, 10/18/08. Force Boyle begins from the top of the highest, steep sandy slope on the southern end of the west face. 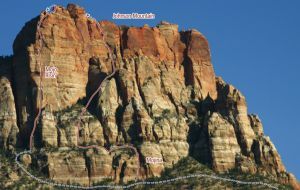 This route climbs nice features with good protection on the difficult sections. Which SuperTopo guidebooks include a topo for Force Boyle?